WASHINGTON DC. The Revolutionaries arrive…with a supportive Canadian…kind of like Lafayette helping out back in the day. Okay Okay, I know he was French, but the idea’s the same, a kindly foreigner come to help the good guys. 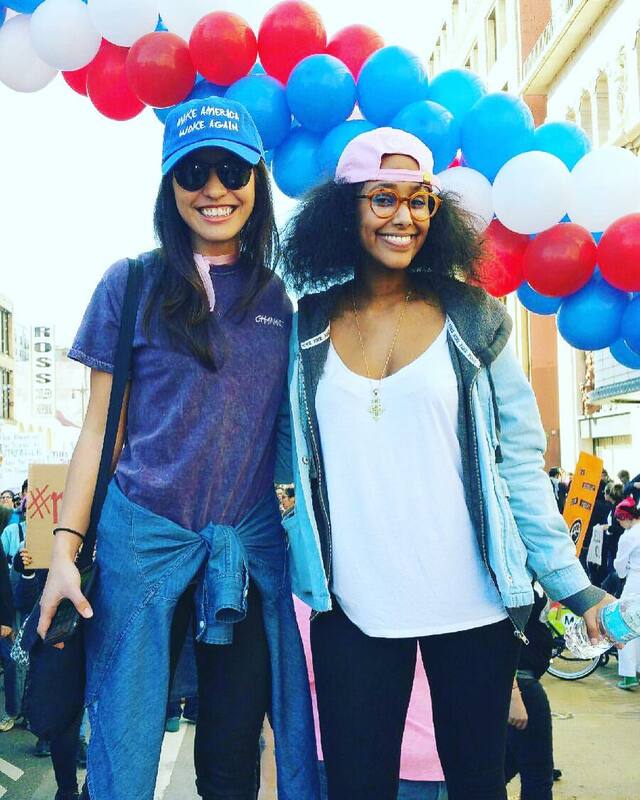 Granddaughter Teresa and friend at LA march. I was in Washington DC yesterday along with over 500,000 other revolutionaries. It was a sight and sound to behold. 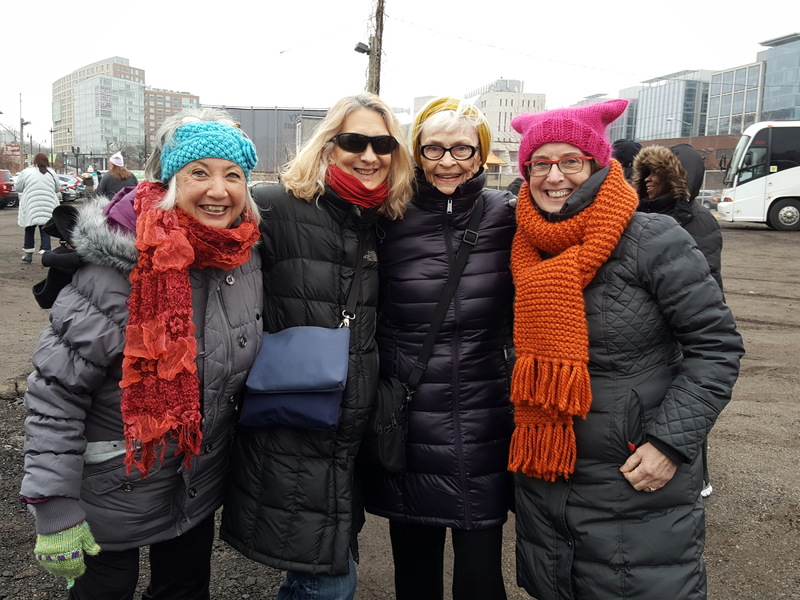 While there were a goodly number of men present it was mostly women—women of every age and size and color. We were so beautiful. There were gaggles of young women, vital and vigorous and ready to (wo)man the barricades. There was a multitude of us elders who will not accept a disreputable woman-hating clown making decisions that affect our daughters and granddaughters—a rally favorite in the sign department was “Now you’ve pissed off Granny.” There were so many families intent on bringing their kids to participate in their futures even if too young to understand the threat that exists. My only regret was that I couldn’t be beamed between rallies—from DC to Los Angeles where my granddaughter was marching, to San Diego where my son and grandson were marching and to Albuquerque where my friends were starting our own New Mexico revolution. The photographs from around the country and the world are beautiful beyond what I would ever have imagined. I went to DC intending to add to the numbers and feel the camaraderie of like-minded people. I did that but also came away feeling more pissed-off than ever at the idea of a coterie of fear-filled men believing they have some god-given right to control the lives of the huge majority of the population with different genitalia, different skin color, different anything. However I was pissed-off in a good way, the way that makes me feel determined and powerful and up to the challenge ahead. Marches alone can’t fuel the revolution but they can certainly put a face/many faces on the social and political activity that will be the night and day work of the actual patriots (us) who are going to save this country from those ‘things that go bump in the night’ (Republicans). Sanity or Ignorance will win and it will happen in the next very few years unless ‘We, the sane and humane’/the patriots/the progressives act now, right now. I’m not sure what will be the most effective actions but that’s my job…to find out and ACT. If the Shyster only had the tiniest bit of the dark and sharp humor expressed in the signs carried in yesterday’s march there might be a ray of hope. Unfortunately we know he is completely devoid of that trait as all narcissists are, so we’ll just have to appreciate the clever poster-makers on his behalf. ← A Day Off. In ALBUQUERQUE. In January. Of 2017. Reblogged this on TIME AND PLACE. I have hope now. I am so impressed that women will not be “governed” by the men and they mean to do something about it this time. That energy can change the equation in 2 years. I hope I can find a way to be a part of it. I must do my duty, whatever that may be.